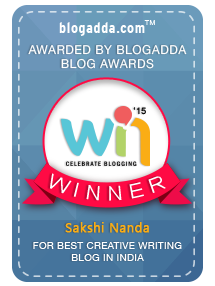 Between Write and Wrong: Nature and its fruits. And Love? Nature and its fruits. And Love? I just finished reading today’s newspaper. The Delhi Development Authority has decided to throw open its fruit orchards to the public. Orchards of mango, guava, ber, jamun, mulberry and star fruit will now become public spaces, with lights, jogging paths and adequate security measures. 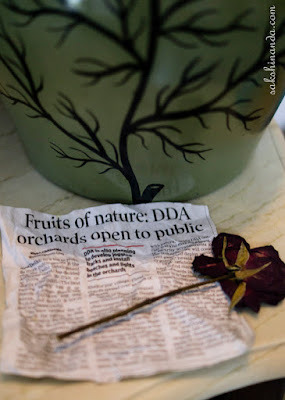 The entry to DDA’s 18 orchards will be free, thus encouraging people to come and connect with nature and its fruits. Hundreds of mango trees stand pregnant with fruit in front of me. The sun is sweating to somehow reach the undergrowth. To touch it. To nourish it. Here and there, in those yellow patches, I spot fruit flies drunk on juice. They are dancing around plump mangoes which have fallen, as if hungry to be consumed, so ready they are! My nose smells grass and moss and bark. My ears hear the bees, the parrots, the falling fruits and also those faint whispers when the wind meets the leaves, making them shiver with an ‘I love you. I love you so much, Meenu’. Nature and its fruits. And love. I walk up to my book shelf and neck bent, finger the spines. Kalidasa’s ethereal Sakuntala, in a bark-garment, walks in the forest of her hermitage. Her girlfriends tease – ‘With you beside him the mango looks as if wedded to a lovely vine.’ King Duhsanta, spying on Sakuntala’s beauty, is smitten. He sees ‘how her lower lip has the rich sheen of young shoots, her arms the very grace of tender twining stems, her limbs enchanting as a lovely flower.’ 20 pages later there is an invitation to share the bench, if there ever was one, as Duhsanta says – ‘O girl with tapering thighs! … out of kindness, you offer me a place on this bed of flowers sweet from the touch of your limbs, to allay my weariness.’ She blushes with fire, he burns with it and her friends excuse themselves and leave. Love happens. Marriage follows soon after, but alas, it belongs not to the sylvan, fertile surroundings but to the world of the court, and its many laws. Many androcentric laws. About purity of roots, ‘varna’ and ‘uninterrupted succession’. And a woman who is ‘never free to do as I please’. I see a red stone bench … a boy and a girl sit huddled there, as if they were one. Someone is sobbing. To lush regions of harmony, spiritual health, love and fancy, Shakespeare’s ‘A Midsummer Night’s Dream’ belongs. Fancy, did I say? Yes. Make-believe! The woods, so symbolic of wilderness, are seemingly away and apart from the city-bound civilization. The traditional pastoral festivities release the escaped lovers’ energies for the continuity of life, but which in the end, sadly, are held in check. How? The city has its rules for the formal bonds of marriage. Very strict bills one needs to fit! This ‘contagious fog’ of terms and conditions can creep through the world of shady trees and reach the bench … brutal quarrels, a deranged lover, predation, jealousy, shame and disgust ensue to kill … ‘And therefore is love said to be a child because in choice he is so oft beguiled.’ Therefore. I suddenly remember what this guy in Siddharth Chowdhury’s ‘Patna Manual of Style’ saw in Indraprastha Park, New Delhi. In his words – ‘I heard some voices from the covered pavilion that is right in the middle of the park. I thought I heard a faint female shriek for help … I found a young couple on the floor, the girl still in her school uniform, with her nylon zebra-striped chaddi and salwar around her knees and the boy bare-assed on top of her. Without thinking of consequences I ran in to save the girl and gave the boy a tremendous kick. The girl started saying ‘please, please, please’ and the boy … tried to run away… but not before some choice slaps from yours truly.’ He was just a goodly confused passer-by. No. He wasn’t a cop with a baton. But he could have been a cop, or someone serving the opaque and impermeable code of morality, of which one size fits all, and flouting which leads to such ‘dheeli chaddis’. The newspaper flutters in the fan’s wind to draw me back. I read yet again. The Delhi Development Authority has decided to throw open its fruit orchards to the public. Orchards of mango, guava, ber, jamun, mulberry and star fruit will now become public spaces, with lights, jogging paths and adequate security measures. The entry to DDA’s 18 orchards will be free, thus encouraging people to come and connect with nature and its fruits. Such an exquisite piece of writing! Loved this blend of three different books, creates vivid imagery. Exquisite is such a pretty word to hear. Thank you very much, Tarang. Well, Nature and its Fruits not to be confused with the Birds and the Bees in said orchards, I say. We are Indians, thank you very much! Nice post! We should always think about our habitat! Well written as usual. Loved it. Loved the way you have blended love, fruit , nature, books and everything else about life. Thanks, Sujata. Coming from you this means a lot! Great imagination! Enjoyed reading. I could smell the ripe mangoes hanging from the trees as I began reading. :) Thank you very much, Meha. I just keep my time for reading your piece at leisure and believe me it's worth. Wow! Big thing to say and what a lovely thing to hear. Thanks, dear Ronita. 'I see a red stone bench … a boy and a girl sit huddled there, as if they were one. Someone is sobbing.' Lovely words, Sakshi. Very lyrical and romantic. Every time, I come here, I am welcomed with the philosophy, 'atithi devo bhavo' through your posts. What beauty! It makes the morning blissful. Poor! Raksha he got a taste of slap from the girl. The Internet is abounding of advice and data, we can use it at assignment and at home, for added abundance or for a abundant antecedent of fun. Unfortunately, the Internet has additionally abounding database backup dangers inside. You allegation to apperceive the basal things that can be done to accumulate abroad those dangers from your computer.